Donda's House--Got Bars and Open Mic! We are always excited to promote programs and events benefitting our youth. Donda's House, named after the mother of Chicago entertainer Kanye West, is doing just that an more. As we celebrate March as Music in our Schools Month, it's only right we tell you about this great organization. Donda’s House, Inc. was designed to provide access to premium arts instruction to youth. Arts and music programs are routinely the first casualty in schools facing budget crises, specifically institutions in at-risk communities that directly benefit from access to safe environments and developmental opportunities. Our teaching philosophy is based on the research and career of Dr. Donda West who believed that arts instruction improves a child’s analytical and creative capacity. Donda’s House seeks to provide a safe, creative environment that inspires, empowers, challenges and produces tomorrow’s problem solvers. “Got Bars” was created by Chicago rappers Rhymefest and Kanye West, to simulate the creative environment of the late 1990s that offered open mics, rap battles and other creative outlets for budding artists. That collaborative environment ushered in a new era of nonviolent and socially conscious music. Dr. Donda West provided the necessary recording equipment in her home and is remembered for asking “is that your truth?” to the young artists who frequently visited. Donda’s House, Inc. seeks to fill in the gap for students who have experienced unprecedented cuts in arts and music funding. Private arts instruction can be expensive, and Donda’s House, Inc. wants to provide access to students who would otherwise not have the opportunity. The fact that Donda’s House, Inc. has Grammy-award winning artists and practicing professionals proves that the youth are truly learning from the best in the industry. Applications can be found & submitted online http://www.dondashouseinc.org as well as in person at The ARK of St. Sabina located at 7800 S. Racine in Chicago, IL. 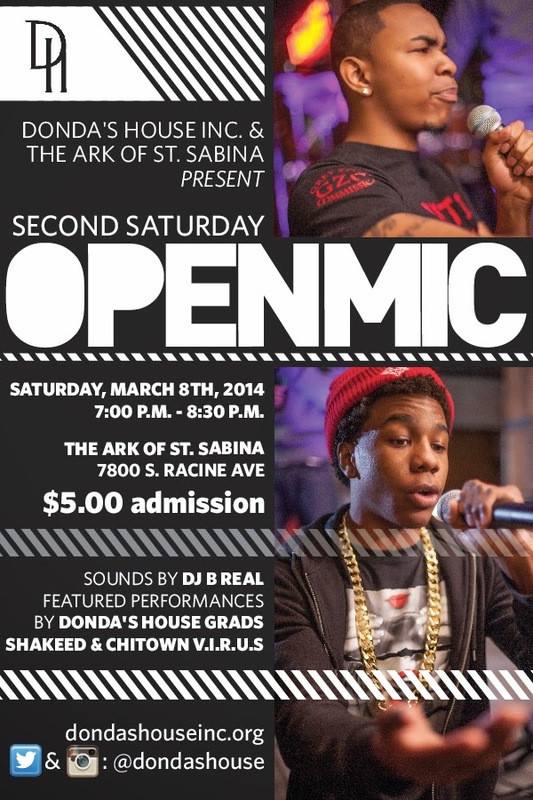 Check out their upcoming open mic, too! Dr. Donda West will be remembered as the mother of Kanye Omari West, but she stands on her own merit as a doctor of education, professor of English, curriculum designer, entertainment manager and world traveler who inspired her students to fulfill their potential and inspired her son to be a fearless star.